Scalp hair is a powerful communication and social signal and so it is not surprising therefore that deficiency of scalp hair can cause significant psychologic trauma. This is particularly so in the more clinically-defined entities such as androgenetic alopecia, alopecia areata, and chemotherapy-induced alopecia, but may also appear in cases of hair thinning/loss that fall short of a formal clinical diagnosis. Moreover, chronologic aging also alters hair phenotype by increasing the propensity for hair thinning and loss, as well as a reduction in hair growth rate and hair pigmentation. ,,, The internal structure of even vigorously growing hair also changes with age, including via a reduction in cystine disulfide (S-S) content of the hair cortex, , and so the term "senescent" alopecia has emerged. , While clinical hair loss is evident to a suitably trained clinician, there may also be sub-clinical hair growth deficits that can affect hair density (per unit area), growth rate, anagen/telogen ratios, fiber diameter, fiber weight, fiber tensile strength, etc., Such deficiency in optimal hair growth may be due to changes in menopausal/hormonal status, advancing age, , poor diet, psychosocial stress, etc., or a combination of all. Furthermore, it is not trivial to separate change to female hair growth pattern that may be related to age versus menopausal status. One should note that sub-clinical hair thinning and increase in hair fall may be an early stage in the gradual process of a clinical condition like female pattern hair loss,  where "excessive" hair shedding may occur without a significant reduction in hair density. While little can be done to slow chronologic aging (e.g., via telomere shortening), delay of biologic aging (e.g., imbalanced oxidative stress-associated damage) may be possible,  as the quantity and quality of hair reflects the body's nutritional status. ,, Hair follicles exhibit enormous cellular activity and represent the body's second or third highest turnover rate after gut epithelium and bone marrow. , This intense metabolic activity is dependent on the supply, uptake, and transport of nutrients, including amino acids/proteins, calories, trace elements, and vitamins. Moreover, as the hair fiber is more than 99% protein, an adequate supply of high-quality protein/amino acid is particularly crucial. , Indeed, enrichment of even a normal diet with sulfur-containing amino acids increases wool production in sheep. ,, Thus, cystine may be a candidate when considering which nutrients could be used for improving hair growth in humans. Studies on the effect of dietary supplements containing L-cystine (usually in combination with B-complex vitamins) have shown improvements in the trichogram and in hair tensile strength. ,, and hair growth in otherwise healthy women (25-65 years) with telogen effluvium (TE). , Here, the actives therapeutic effect probably results from anagen induction. The needs for certain types and quantities of nutrients may change with age, and it is notable that TE is a common cause of hair loss in older patients, especially women, where the anagen hair follicle is prematurely transitioned to telogen driving the normal anagen/telogen ratio of 90:10 to 70:30, with resultant increase in hair shed rate from approximately 100 to more than 300 hairs/day. ,, The hair pull test is usually positive, although differential diagnosis should include androgenetic alopecia and/or senescent alopecia. Attempts to remove causal trigger(s) can be difficult, as TE can present with sudden onset or in a more chronic state, characterized by recurring episodes of hair shedding over several years. Until date, medications, surgery, thyroid or other metabolic disorders, high fever and major psychosocial stress can trigger acute TE-like hair loss episodes in women, whereas in premenopausal women this can be associated with dietary deficiency (e.g., iron), crash diets, and after childbirth. Some have recently suggested the involvement of dietary deficiency in some forms of nonscarring clinical and subclinical hair loss. This is worth looking at in our view, given the penetration of fast food and highly-processed food into our modern diets, along with the fast pace of our modern work and social lives. A dietary insufficiency/deficiency of vitamins and minerals and quality proteins may be further exacerbated in vegetarianism, which is more commonly represented in women. Other cases may involve increased nutrient loss or poor nutrient absorption. Against this backdrop, the potential benefit of dietary supplementation has gained favor, although whether this approach positively influences hair growth in such cases, as measured objectively, has been uncertain. Here we attempt to assess the value of a dietary supplement containing marine extracts (i.e. marketed as "Viviscal" - Lifes2good, Galway, Ireland) via a multi-site, double-blinded placebo-controlled clinical trial. To our knowledge, this is the first double-blind, placebo-controlled trial using a hair shedding and photo-trichogram based approach of a marine-derived supplement for hair growth and follows on from our previous more limited study. The primary end points were a shed hair count analysis and a phototrichogram-based analysis of hair fiber diameter after a 6-month consumption of the oral supplement compared to the placebo group. The trial was a double-blind, placebo-controlled clinical study involving female subjects with self-perceived thinning hair and was conducted by the contract research organization (Thomas J. Stephens and Associates, Inc., Texas, USA) with Board Certified Dermatologists as study investigators at two sites (Carrollton, Texas, USA and Colorado Springs, Colorado, USA). The trial has been registered on https://clinicaltrials.gov/NCT02288858. The test product was a drug-and hormone-free oral dietary supplement designed to promote the quality of existing hair growth and/or to promote growth of existing hair for women suffering from self-perceived temporary thinning hair. The key ingredients in this product are AminoMar ® a compound of marine extracts. The placebo treatment consisted of inert tablets with similar appearance. The protocol, informed consent agreement, and video/audio scripts were approved by IntegReview Institutional Review Board (IRB, a duly constituted IRB under title of 21 Code of Federal Regulations [CFR], Part 50. Written informed consent conforming to 21 CFR 50.25 was obtained from each subject prior to enrolment in the study. A total of 96 eligible female subjects were screen for enrolment in this study. 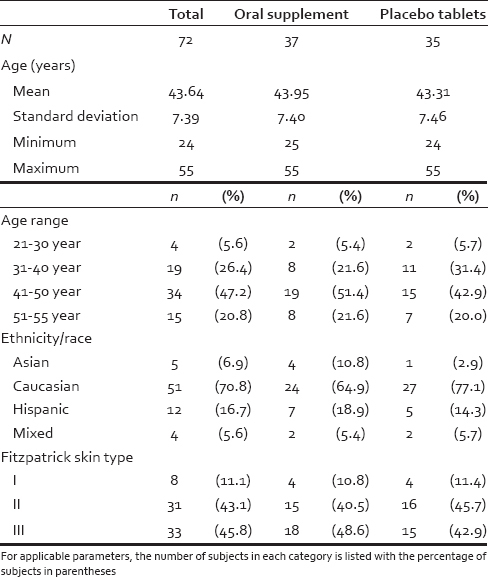 The participant demographic information is found in [Table 1] and [Table 2] and included age, ethnicity/race, nationality, and Fitzpatrick skin phototype. Both the Dallas and Colorado Springs trials were conducted over the same period of the year (April/May-November). Both sites are temperate regions (i.e., between 30°N and 60°N) and can be assumed to have similar seasonal influences on hair growth cycling. Potential subjects were screened by telephone for eligibility prior to the study start. Women between 21 and 55 years of age with self-perceived thinning hair, which they believed may be associated with poor diet, stress, lifestyle, etc., were scheduled for screening at the clinic. Prospective subjects were instructed to refrain from washing their hair for at least 24 h prior to each clinic visit. Visit 1 - The prospective subjects were evaluated for the following eligibility criteria: (a) Fitzpatrick skin phototype classification. Skin types I-III were included, with 89% of participants having type II and III (i.e., tans minimally to gradually); (b) pregnancy status was assessed via urine pregnancy test. Subjects with a negative urine pregnancy test qualified; (c) scalp examination for each subject included a screen for immediately observable medical issues and any scalp alopecia/scalp disorders. Finally, a physical examination by a qualified nurse/nurse practitioner was conducted (scalp skin, head, eyes, ears, nose, throat, respiratory, cardiovascular, gastrointestinal, neurological, musculoskeletal, and other), vital signs (blood pressure, pulse), respiration rate, temperature, and body mass index. All participants agreed to maintain their normal hair shampooing frequency and add the oral supplement to their current daily routine while not substantially changing their current diet, medications, or exercise routines for the duration of the study. They also agreed to have a small tattoo dot applied to target 1 cm 2 area of scalp which was shaved to 1 mm in length and dyed black. Qualified subjects were assigned a subject number and assigned to a treatment group, Viviscal oral supplement or placebo tablets, according to a randomized study design in which random numbers were generated using the Data Analysis Toolpak in Microsoft Excel using randomly generated number seeds. Randomization of clinical procedures had no input of subject information and conditions. Before the study started, randomization code was generated to ensure all qualified subjects were completely randomized to one of the two treatments prior to any data collection. Therefore, the placebo and treatment group were likely balanced for the causes of their perceived hair thinning/hair loss given that the power calculation indicated that the sample size was sufficiently large. Any difference seen between the two groups at baseline (i.e., hair count and hair width) would be due to random chance. The 1 cm 2 target area was 1-2 cm lateral to the scalp mid-line half the distance between the forehead hairline and the vertex. The target area was demarcated with one small black dot tattoo to ensure proper alignment of the photography equipment at subsequent visits, with tattoo location recorded using distance from tattoo to right pinna, distance from tattoo to left pinna, distance from tattoo to tip of nose. A phototrichogram (via macro photographs) of each subject's target area were captured using a Nikon D200 DSLR camera system in combination with a Canfield EpiFlash system. A mm ruler was included in each image to ensure the magnification of images could be calibrated during analysis. Clinical evaluations were conducted at visit 1 (day 0), visit 2 (day 2), visit 3 (3 months ± 2 weeks), visit 4 (2 days after visit 3), visit 5 (6 months ± 2 weeks), and visit 6 (2 days after visit 5). Hair dyeing of the target areas was performed at day 0 and (if fading had occurred) at day 2, 3 months ± 2 weeks, 2 days after visit 3, 6 months ± 2 weeks, and 2 days after visit 5. Visit 2 - Subjects returned to the clinic and after completion of photographs, participated in the following experimental protocols. Shed hair was collected during shampooing using a well-established cheesecloth sink capture technique. Hair was washed for 60 s, gently rinsed and was gently combed. The shed hairs collected from the comb. The sink capture cheesecloth was removed, labeled and dried, and captured hairs counted and recorded. The subjects were given a 3-month supply of the tablet (Viviscal oral supplement or placebo tablet), a calendar of study visits, and a daily diary (to record product application times, any comments, and responses to a weekly question regarding their hair loss), and verbal and written usage instructions to take 3 tablets per day as follows: One tablet in the morning, at mid-day, and evening with water and after food. Clinical trial staff contacted each subject approximately 1 month after visit 1 to give compliance reminders and ask for feedback on product usage. Visit 3-6 - The subjects returned after 3 months ± 2 weeks (visit 3), 2 days after visit 3 (visit 4), at 6 months ± 2 weeks (visit 5), and 2 days after visit 5 (visit 6) to repeat the above procedures. Test products were collected and counted for compliance and new units distributed at visit 4. A physical examination was repeated at visit 3 and visit 5 and shaving of the target area repeated at visit 3 and visit 5. Hair dyeing and tattooing of target areas was repeated if fading had occurred and digital photography repeated at each visit with shampooing/combing and hair counts repeated at visit 4 and visit 6. The per-protocol (PP) population (n = 72) was the primary population for this study, as preanalysis revealed that there were no significant differences by comparison with the intention-to-treat (ITT) population (n = 74). The PP population included all subjects who were deemed eligible for study participation and who completed the study according to the protocol and were analyzed [Table 2] and [Table 3]. Shed hair count data were analyzed to include number of observations, mean, standard deviation, median, and minimum and maximum at all the time points. Mean of the change from baseline (defined as postbaseline value minus baseline value) was estimated at postbaseline time points. The percent mean change and the percentage of subjects who improved or worsened were calculated. All statistical tests were two-sided at significance level alpha = 0.05, and performed using SAS software (version 9.20 series, (SAS Institute, Johannesburg South Africa). Data analyses were performed independently of those conducting the clinical aspects of the trial. For shed hair counts, the data were also analyzed using a generalized linear mixed model (a Poisson regression), where the baseline value, treatment and visit were considered as fixed effects while the subject was a random effect. The change from baseline for the active and placebo treatments was tested separately at each postbaseline time point within the model. The null hypothesis was a zero mean change from baseline. The two treatments (test vs. placebo) were compared at each postbaseline time point for a null hypothesis that mean of active supplement group is equal to mean of placebo supplement group after baseline adjustment. For phototrichogram data, the mean hair thickness (μm) data (terminal and vellus-like) were assessed by a paired t-test (for change from baseline) and a two sample t-test (for comparison between treatments). Increase hair counts/measurements over time reflects treatment efficacy. For analysis of total number of hairs (terminal and vellus-like) a Wilcoxon signed rank test (for change from baseline) and Wilcoxon rank sum test (for comparison between treatments) were used. The data were presented as bar plots of the percent mean change from baseline. For each subject and time point (baseline [day 0], 3 months, 6 months) individual hair fiber type was defined using hair diameter (μm) from phototrichogram pixel data. Vellus-like hair was defined as hair ≤40 μm and terminal hair defined as >40 μm in diameter, according to well-established criteria. However, in the context of this study, a more accurate definition is "vellus-like fine hair," as these fine scalp hairs were considerably longer than the typically-defined 3 mm of vellus hair fibers. Total hair number and mean hair diameter (μm) in the target scalp area were calculated and analyzed. Similar statistical analyses were performed as described for shed hair count data. Digital images were analyzed using Image Pro Plus software (Media Cybernetics Inc., Rockville, Maryland, USA) using an analysis macro developed by Batchelor (see: Alces Imaging and Automation http://alces.us/). For those digital images, 1 pixel equaled 5.4 μm, and for each photograph an area of interest (AOI) of 0.5 cm × 0.5 cm (0.25 cm 2 ) was selected in the middle of the shaved area to avoid noise and inconsistency for all images of each subject throughout the trial. All visible hairs with their proximal end (i.e. root) inside the AOI were included in the analysis. The length of the hair (reflecting hair growth) was measured from the scalp surface to the hair tip, whereas hair diameter (i.e. vellus-like or terminal) was measured as the length of the perpendicular axis to the hair length. An example of a macro photograph of the target area for one subject approximately 1 cm 2 , centered by a small black dot tattoo at day 0 and month 6, respectively, is shown in [Figure 1] to illustrate the phototrichogram analysis technique. This study was designed to target subjects with self-perceived hair thinning, which they believed may be associated with poor diet, stress, and other lifestyle-associated factors. Of the 96 eligible and screened female subjects enrolled in this study 74 participants represented the ITT population of which 72 subjects completed the study (i.e., the PP population, PP). The ITT and PP populations were evenly distributed between those on test and placebo and those between study sites [Table 1]. The ITT population included any subject with valid data that participated in baseline and at least 1 postbaseline evaluation. The results of the PP population analyses and the ITT population analyses were very similar; therefore, only the data results from the PP population are included here. Discontinuers were evenly balanced between both sites (10 at Dallas and 14 at Colorado) and none had continued on the study beyond visit 1. Reasons for discontinuation from the 96 starting population included adverse event (n = 4); withdrawal request by subject (n = 10); noncompliance/investigator decision (n = 5); exclusion criteria not met (n = 1); loss to follow-up (n = 4). The most common side effects were mild bloating and stomach discomfort (n = 6; 3 from test product and 3 from placebo groups). 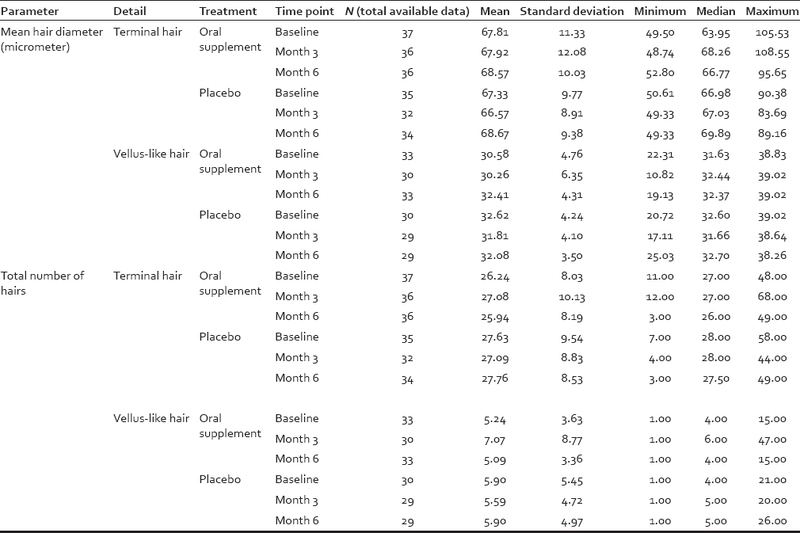 Results from shed hair count analysis indicated that hair shedding was significantly reduced after consumption of the oral supplement during the course of the study and that this change was statistically significant at month 3, and was sustained to month 6, when compared with baseline values [Table 3]. Moreover, shed hair counts of the total number of shed hairs were consistently lower for the oral supplement group compared to the placebo group during the course of the study and the difference was statistically significant after 3 months of active supplement consumption [Table 3]. A similar difference between the 2 treatments was observed at month 6, but was not statistically significant at this time point. This observation suggests that there is an attenuation of hair shedding in the oral supplement group. 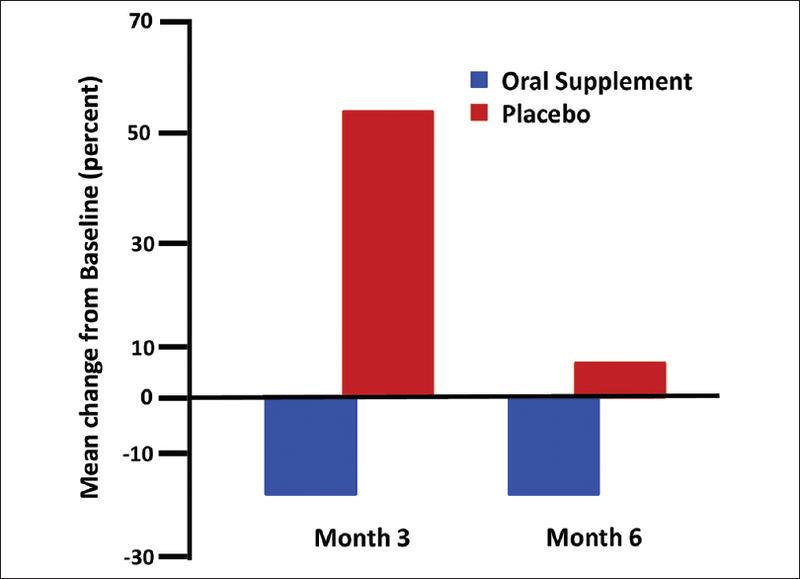 This mean change from baseline for shed hair counts at month 3 and month 6 is shown in [Figure 2] for both oral supplement and placebo groups. The shed hair count exhibited a wide range among different subjects, likely caused by differences in age (24-55 years), hair style type (long or short), or normal shampooing routine when done at home. However, as a group those taking the placebo exhibited a >50% increase in shed hair count at month 3 and ~8% increase at month 6 when compared to baseline. This contrasts with those taking the oral supplement where a mean approximately 20% decrease in shed hair count was observed at month 3 and month 6 when compared to their baseline. Consumption of the oral supplement increased the mean hair diameter of vellus-like hair after 3 and also at 6 months. This improvement attained a statistical significance level of P = 0.02 at 6 months [Table 4]. An opposite trend was observed in placebo-treated individuals at both month 3 and 6. Overall, more than 60% of subjects' vellus-like hairs were getting thicker after using the oral supplement; whereas about 60% subjects' vellus-like hairs were finer after using the placebo [Figure 3] compared to their baselines. The extent of increase in vellus-like hair diameter after 6 months of daily consumption was modest, at just less than 8%. This mean change from baseline for those consuming the oral supplement was approximately double the increase observed at 3 months (approximately 4%) [Figure 3]. The mean vellus-like hair diameter change for those consuming the placebo tablet showed a continued reduction in vellus-like hair diameter of over 5% after 3 months, with a trend toward statistical significance at P = 0.069 and 2% approximately after 6 months (no statistical significant tend). The approximately 8% change in vellus-like hair diameter observed in this study for those consuming the oral supplement was the average change calculated from all participants. The approximately 8% change in vellus-like hair diameter observed in this study for those taking the "active" oral supplement was the average change calculated from hairs within the AOI of the phototrichograms from the full cohort. While the measurements were per hair per image per participant, these data were pooled together. Resolution was determined on the image using a millimeter ruler included in the picture. This ~ 8% change, although small in magnitude, was statistically significant. A summary of image analysis data for all hairs (terminal and vellus-like) is shown in [Table 5] and [Table 6]. As social beings we communicate significantly via our physical appearance and so our skin and hair quality are potent vitality signals. There is also some anecdotal evidence that some milder forms of hair loss may be becoming increasingly common, , and enquiries to cosmetic surgery clinics are reported to have risen significantly over the last couple of decades, including from younger women. Experts in the clinical assessment of hair growth abnormalities have begun to look at relatively recent changes in lifestyle including the increase in highly processed, high fat, high sugar, and high salt diets that can be nutrient-poor. Attempts have been made to access the potential value of dietary supplements for hair growth. One of the cardinal traits of hair thinning/loss conditions is increased shedding. Thus, there was an interest to access whether daily consumption could both reduce hair shedding and increase hair fiber vitality as measured by hair diameter. The oral supplement used in the current study was designed for hair growth support and contained AminoMar ® , a marine complex, has been available for over 20 years and has been sold in over 40 countries worldwide. To our knowledge, this is the first double-blind, multisite, placebo-controlled, hair shedding, and photo-trichogram trial of a marine-based product supplement for hair growth. Results from the current study have shown that hair shedding was significantly reduced in the first 3-6 months of daily consumption of this oral supplement. Shedding had slowed in this group by month 3 to a statistically significant extent compared to baseline. Moreover, counts of the total number of shed hairs were consistently lower for the oral supplement group compared to the placebo group during the course of the study and the difference was statistically significant after 3 months of active supplement consumption. At 6 months the difference between the two groups was sustained, even though it no longer reached statistical significance. 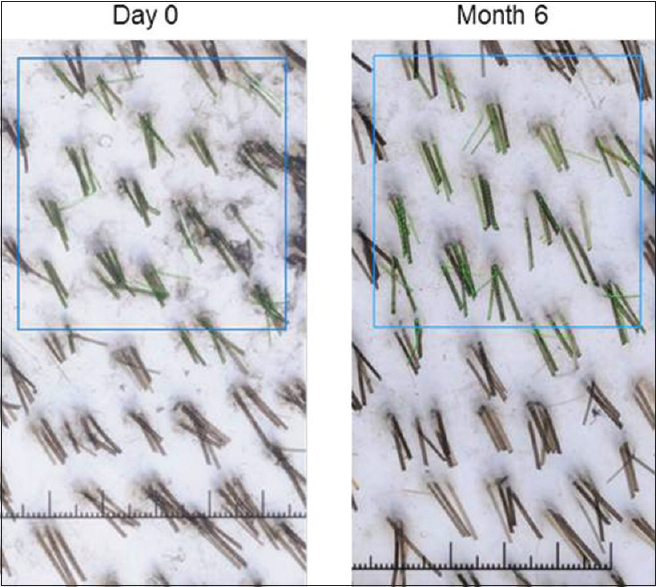 These data could be interpreted to indicate that targeted hair follicles in the affected scalp of those taking the oral supplement moved from telogen to the early anagen growth phase. Thus, fewer hair follicles are part of the shedding hair follicle population on the scalp of subjects taking the supplement compared with those taking the placebo. This attenuation of hair shedding in the oral supplement group is also likely to favorably impact the subjects' perception of fewer hairs being shed and possibly signal that the condition may have stabilized. While the effects of the oral supplement on lowering numbers of shed hairs represented a clear positive benefit, one must also consider possible contributions of seasonal shedding, even in humans. , This study was mapped carefully to seasonal influence on hair growth dynamics. Both the Dallas and Colorado Springs trials were conducted over the same period of the year (April/May-November). Both sites are temperate regions (i.e., between 30°N and 60°N) and can be assumed to have similar seasonal influences on hair growth cycling. In healthy human adult scalp the proportion of hair follicles in the anagen or growth phase peaks in March, and falls steadily to lowest anagen in September when the hair follicles are already in late telogen or have moved to exogen (active shedding phase). , Thus, one can expect that the number of shed hairs to peak in August/September, that is, when the fewest hair follicles are in anagen. Baseline data in the current study were gathered in spring (April in Colorado; May in Texas), that is, not be peak time for normal healthy scalp shedding. Thus, this allows us to identify any hair shedding above the expected rate, and so detect a status that may be tractable to stabilizing via an intervention. The peak in shed rate is August (i.e. or month 3 of our trial). While this is when shed rates would be expected to peak (in any event), this is perhaps even more so in scalp not benefiting from a positive influence (i.e. placebo). The corollary of this therefore, is that shed rates in optimally-nourished hair follicles (i.e. with active) may be reduced at this point even for those already entering the trial with perceived higher shedding rate (i.e. a suboptimal hair growth starting point). Month 6 (end of trial) will also coincide with a further transition of the hair cycle where a proportion of scalp shed (or telogen) hair follicles will re-enter anagen (growth phase), and during which we would expect to see less shedding in all participants (active and placebo), but conceptually comparatively less shedding in those with an prolonged or elongated anagen (i.e. after a positive intervention). It is of note that we see independent support for this interpretation in the observed increase in diameter of some hair fibers (fine vellus-like) in the treated group. This is consistent with anagen prolongation/extension, as these hair follicles will require increased keratinocyte proliferation to produce thicker hair fibers. An analysis of the diameter variation in the shed hair samples was not conducted in this study, though would be useful in further studies as this may reveal to what extent a population of longer finer hairs occurs in individuals expressing self-perceived hair thinning/loss. A second important outcome of this study was from phototrichogram image analysis, which revealed a statistically significant increase in the mean vellus-like fine hair diameter after 6 months of the Oral supplement consumption, when compared to the mean vellus-like hair diameter measured at baseline. Shedding hair counts and the use of a phototrichogram (i.e., macrophotographs) should be considered as two independent assessments for measuring different aspects of hair growth condition. While image analysis on macroscopic photographs is not intended for assessment of total scalp hair count, because of the limited sampling area and practical issues mentioned above, it works well for categorizing and assessing vellus-like hair versus terminal hair. The image analysis of macrophotographs and the shed hair count assessment are therefore two complimentary approaches for assessing hair growth conditions. Macrophotographs provide a view of what types of hairs are changing; while the shed hair count provides a more global view as to what is happening to the whole scalp. However, because of the small area captured in the macrophotographs, it is not realistic to use that to confirm global hair count changes. The impact of the oral supplement on hair growth may also be a function of dosage. At the dosage used in the current study the product increased vellus-like hair diameter suggesting that the vellus-like hair follicles may be increasing in size (as hair fiber is proportional to follicle size. If this were to continue for up to 1 year or more, it is plausible to expect that these responsive vellus-like hair follicles would transition toward production of terminal hair, and so longer usage (i.e., beyond 6 months) of the oral supplement may result in an increase in terminal hair counts. The latter was not seen in the current study, likely due at least in part to the relative short study duration. The scalp area subjected to image analysis occupied 0.2% of total scalp, and so may not be realistic to expect an increase in total hair count to be observed in such a small area unless the increase was very high (>10% for most people). At the same time, it was impractical to sample (i.e. shave) a much larger area (e.g., 5-6 cm 2 , ~1% of scalp surface) for image analysis. We did assess the total hair count and hair diameter using a double blinded participant questionnaire (i.e., subjects did not know whether they were in the active or placebo group). 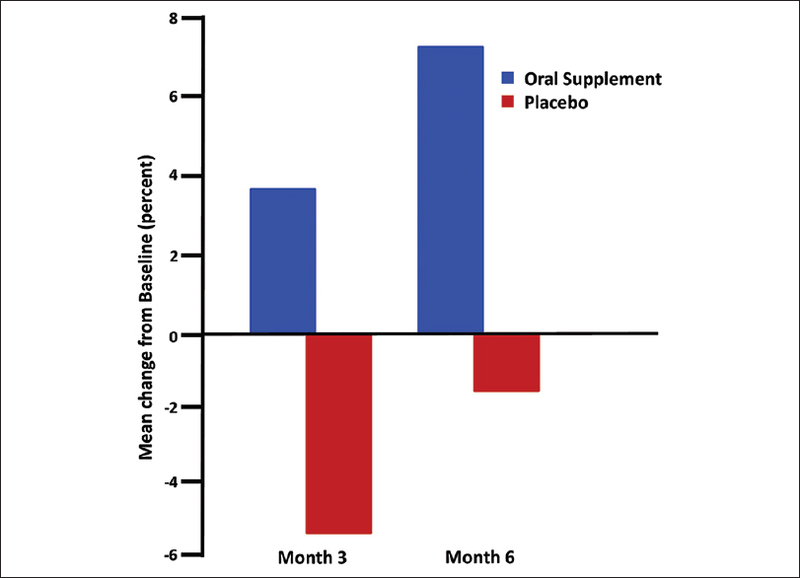 Those taking the oral supplement exhibited a statistically significant favorable change in their overall hair volume at 6 months (P < 0.007) compared with placebo (P = 0.238) (data not shown). This is more likely due to a reduction in shedding than via the modest 8% increase in vellus-like hair diameter within this limited timeframe. The 8% change in mean vellus-like hair diameter for those taking the oral supplement, although small in magnitude was statistically significant. As the supplement was only used for 6 months a relatively short time in the context of shifting the hair growth cycle to a more anagenic status and for these hair fibers to be observable on the scalp surface, it is a considerable change in our view and one that could be expected to continue with duration of supplementation. Moreover, it may be useful to relate this modest increase in fiber diameter to its likely effect on fibre stiffness. Hair fiber diameter and fibre stiffness are related,  and this 8% increase in fibre stiffness of longer vellus-like hairs could be interpreted by the individual as a feeling of greater body and volume. This concurs with the results of the self-perception questions (data not shown). This study did not formally assess the hair follicle population dynamics in terms of phase of the growth cycle; this was not a primary outcome for this study. However, overall, we consider that the data show a positive effect on hair growth cycle dynamics for the Active group at 3 and 6 months, with fewer hair follicles in the telogen to exogen (shed) transition. This resulted in a reduction in hair shedding (from a global scalp perspective rather than via a unit area trichogram) from hair follicles that are therefore likely to be still in anagen. In comparison, the placebo group showed no such trend. There may to be some placebo effect, as there is in many studies of this type; so it is possible that there exists some modulation of shedding rates between start, mid-point, and end of the study even for the untreated participant and even after subtracting seasonal influences in hair cycle dynamics. The significant increase in shed hairs at month-3 for Placebo suggests that the hair cycle may be trending toward higher telogen to exogen hair rates, leaving fewer hair follicles (as a proportion of overall hair follicle numbers) to progress to shedding in the second half of the trail's timeline. The striking shed rate in the Placebo group at month-3 by many, but not all of the subjects, is reflected by a large standard deviation in this group. While the reason(s) for the latter is unclear, but we believe this to be valid observation, particularly since the groups were evenly balanced at baseline. There is also the possibility that the loss of significant difference in shed rates between placebo and active at month-6 may result from a type II statistical error (i.e., a false negative) in the data. Nonetheless, the mean value for Placebo group remains higher, and we believe that the active treatment has thus stabilized the hair cycle, revealing fewer shed hair counts compared to placebo. In summary, the data suggest that a nutritional approach to improving the hair follicle environment from within can be used to aid hair growth where this is suboptimal due to possible dietary deficiency or insufficiency. A supplement like Viviscal, containing the marine complex AminoMar ® tested here may be a useful dietary adjunct to aid optimal scalp hair growth. The authors thank Profs. Desmond J Tobin and Andrew G Messenger for careful review of trial study design and this manuscript. The study was 100% funded by Lifes2good. James Murphy is an employee of Lifes2good. Drs. Rizer, Stephens, Herndon and Sperber are employees of Thomas J Stephens and Associates, an independent Clinical Research Organisation. Trṻeb RM, Tobin DJ, editors. Aging Hair. Berlin, Heidelberg: Springer-Verlag; 2010. Naruse N, Fujita T. Changes in the physical properties of human hair with age. J Am Geriatr Soc 1971;19:308-14. Van Neste D. Thickness, medullation and growth rate of female scalp hair are subject to significant variation according to pigmentation and scalp location during aging. Eur J Dermatol 2004;120:895-904. Kuzuhara A, Fujiwara N, Hori T. Analysis of internal structure changes in black human hair keratin fibers with aging using Raman spectroscopy. Biopolymers 2007;87:134-40. Thibaut S, de Becker E, Bernard BA, Huart M, Fiat F, Baghdadli N, et al. Chronological ageing of human hair keratin fibres. Int J Cosmet Sci 2010;32:422-34. Sinclair R, Jolley D, Mallari R, Magee J, Tosti A, Piracinni BM, et al. Morphological approach to hair disorders. J Investig Dermatol Symp Proc 2003;8:56-64. Tajima M, Hamada C, Arai T, Miyazawa M, Shibata R, Ishino A. Characteristic features of Japanese women's hair with aging and with progressing hair loss. J Dermatol Sci 2007;45:93-103. Johnson KA, Bernard MA, Funderburg K. Vitamin nutrition in older adults. Clin Geriatr Med 2002;18:773-99. Finner AM. Nutrition and hair: Deficiencies and supplements. Dermatol Clin 2013;31:167-72. Lengg N, Heidecker B, Seifet B, Trüeb RM. Dietary supplement increases anagen hair rate in women with telogen effluvium: Results from a double-blind placebo-controlled trail. Therapy 2007;4:59-65. Stenn KS, Paus R. Controls of hair follicle cycling. Physiol Rev 2001;81:449-494. Weinstein GD, Mooney KM. Cell proliferation kinetics in the human hair root. J Invest Dermatol 1980;74:43-6. Gold RJ, Scriver CG. The amino acid composition of hair from different racial origins. Clin Chim Acta 1971;33:465-6. Tea I, Le Guennec A, Frasquet-Darrieux M, Julien M, Romek K, Antheaume I, et al. Simultaneous determination of natural-abundance d15N values and quantities of individual amino acids in proteins from milk of lactating women and from infant hair using gas chromatography/isotope ratio mass spectrometry. Rapid Commun Mass Spectrom 2013;27:1345-53. Frenkel MJ, Gillespie JM, Reis PJ. Factors influencing the biosynthesis of the tyrosine-rich proteins of wool. Aust J Biol Sci 1974;27:31-8. Gillespie JM, Reis PJ. The dietary-regulated biosynthesis of high-sulphur wool proteins. Biochem J 1966;98:669-77. Reis PJ, Tunks DA, Sharry LF. Plasma amino acid patterns in sheep receiving abomasal infusions of methionine and cystine. Aust J Biol Sci 1973;26:635-44. Ahrens J. Systemic treatment of diffuse hair loss [German]. Therapiewoche Schweiz 1994;10:551-4. Budde J, Tronnier H, Rahlfs VW, Frei-Kleiner S. Systemic therapy of diffuse effluvium and hair structure damage. Hautarzt 1993;44:380-4. Petri H, Perchalla P, Tronnier H. Effective medical treatment for hair structure damage and diffuse Effluvien - a comparative double-blind study [German]. Schweiz Rundsch Med Prax 1990;79:1457-62. Gehring W, Gloor M.The phototrichogram as a method for assessing hair care preparations the example of a combination of millet, fruit extract L-cystine and calcium pantothenate [German]. Z Hautkr 2000;75:419-23. Harrison S, Sinclair R. Telogen effluvium. Clin Exp Dermatol 2002;27:389-5. Shapiro J. Clinical practice. Hair loss in women. N Engl J Med 2007;357:1620-30. York J, Nicholson T, Minors P, Duncan DF. Stressful life events and loss of hair among adult women, a case-control study. Psychol Rep 1998;82 (3 Pt 1):1044-6. Daniells S, Hardy G. Hair loss in long-term or home parenteral nutrition: Are micronutrient deficiencies to blame? Curr Opin Clin Nutr Metab Care 2010;13:690-7. Dwyer JT. Vegetarian eating patterns: Science, values, and food choices - Where do we go from here? Am J Clin Nutr 1994;59 5 Suppl: 1255S-62S. Glynis A. A Double-blind, placebo-controlled study evaluating the efficacy of an oral supplement in women with self-perceived thinning hair. J Clin Aesthet Dermatol 2012;5:28-34. Blume-Peytavi U, Hillmann K, Guarrera M. Hair growth assessment techniques. In: Blume-Peytavi U, Tosti A, Whiting DA, Trueb RM, editors. Hair Growth and Disorders. Berlin-Heidelberg: Springer-Verlag; 2008. p. 125-58. Camacho-Martínez FM. Hair loss in women. Semin Cutan Med Surg 2009;28:19-32. MacDonald A, Clark C, Holmes S. Frontal fibrosing alopecia: A review of 60 cases. J Am Acad Dermatol 2012;67:955-61. Randall VA, Ebling FJ. Seasonal changes in human hair growth. Br J Dermatol 1991;124:146-51. Tobin DJ. The genetically programmed hair growth cycle and alopecia: What is there to know? Expert Rev Dermatol 2006;1:413-28. Kaufman KD, Olsen EA, Whiting D, Savin R, DeVillez R, Bergfeld W, et al. Finasteride in the treatment of men with androgenetic alopecia. Finasteride Male Pattern Hair Loss Study Group. J Am Acad Dermatol 1998;39(4 Pt 1):578-89. Hayashi S, Miyamoto I, Takeda K. Measurement of human hair growth by optical microscopy and image analysis. Br J Dermatol 1991;125:123-9. Van Scott EJ, Ekel TM. Geometric relationships between the matrix of the hair bulb and its dermal papilla in normal and alopecic scalp. J Invest Dermatol 1958;31:281-7. Robbins C, Mirmirani P, Messenger AG, Birch MP, Youngquist RS, Tamura M, et al. What women want - Quantifying the perception of hair amount: An analysis of hair diameter and density changes with age in caucasian women. Br J Dermatol 2012;167:324-32.